I’m not sure when I first saw a petroglyph, but over the last twenty years or so, my wife and I have done a great deal of traveling to state and national parks and at so many of them we’ve noted and photographed petroglyphs. I am fascinated by visual arts in general, and when I see these petroglyphs or other rock art I am amazed by the tenacity of artists who worked with poor materials, but weren’t stopped by that. The drive to produce art often supersedes the lack of materials. This books details some rock art in the upper Midwest, primarily in the Wisconsin area. Eleven locations are explored and described. Some of these are open to the public, such as Jeffers and Pipestone in Minnesota. Others are locations on private property. For those of us who might pick up this book to find locations to visit, this can be a little disappointing as too many of the locations are private. Also disappointing – and the authors almost hit the reader over the head with their concern – is how many of the petroglyphs have been damaged or destroyed by uncaring visitors. Since most of these petroglyphs are located in limestone caves on farm lands, it is implied (or stated outright, I don’t remember which) that teens looking to party are the likely suspects in the damage. It is disappointing that such historical artifacts are so wantonly destroyed (and the authors make it clear how they feel about this), but kudos to the authors and the Native American councils who are actively working to protect these places. The book is lavishly illustrated with photos and artwork (more on that in a moment) of many of the discoveries. My ARC (Advanced Reader Copy) came with a publisher’s watermark on every page, making it near impossible to actually see anything in the photos, so it’s difficult to comment on the quality of the pictures. One of the things that I enjoyed about this book is that it wasn’t just a flat-out presentation of petroglyph sites. In addition to the photos, the book has many watercolor paintings by artist Geri Schrab. Schrab is clearly moved by the ancient art and works the styles and themes into her own watercolors. It is beautiful synthesis of ancient and modern art. Also included in the book are “Native Voice” writings. It is beautiful to get some written word from modern Native Americans to go along with the art. Looking for a good book? 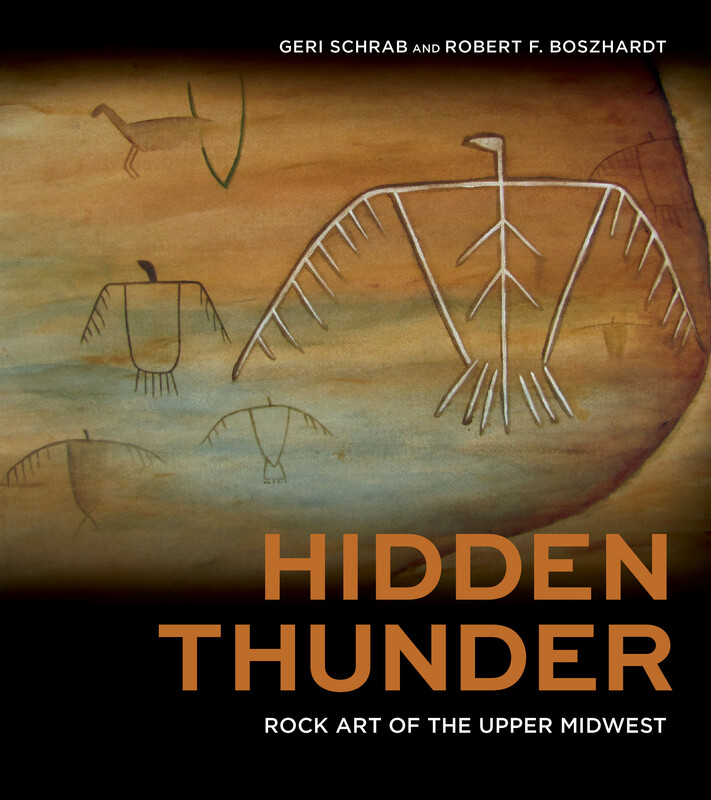 Hidden Thunder, by Geri Schrab and Robert F Boszhardt, is an absolute must read for anyone interested in art history, Native American art, Native American history, or even anyone just interested in a great non-fiction book.